It’s quirky. Sometimes it feels like it’s been stitched together from vignettes and sketches. It had an inauspicious beginning in 1997 as a performance gift from the Toronto Theatre Community to two of its members who were getting married. And there are enough zany characters in it to satisfy the cast list of several musicals. But it’s imaginative, entertaining, and hilariously funny, and it went on to win 5 Tony Awards in 2006. The show is “The Drowsy Chaperone”, and it’s currently onstage in a thoroughly engaging production at Pinckney’s Dio Theatre + Dining. 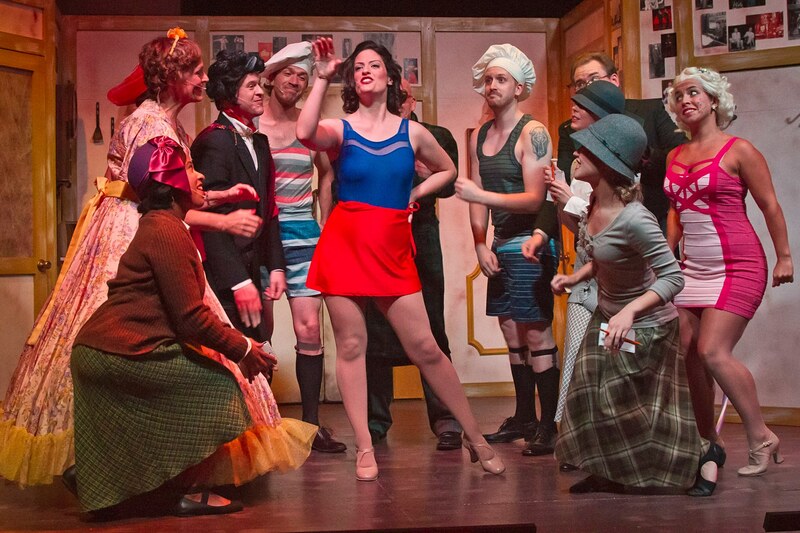 “Chaperone” began as a parody of 1920’s musical comedies. The twenties were formative years for the American Musical stage, and during its fledgling years Broadway musicals often appropriated characters and conventions from vaudeville and musical hall entertainments. Many stock characters and theatrical conventions from those early musicals and later ones can be found in “Chaperone”. The show features mistaken identities, multiple doorways, a dream sequence, and spit takes, where a liquid taken into the mouth gets spit out before it can be swallowed, generally on the closest person around and with amusing consequences. It’s also got roller skating and hoofers and a show-within-a-show. “Chaperone’s” subordinate show has oil tycoon Robert Martin (Steve DeBruyne) about to marry Broadway star Janet Van De Graff (Sarah Brown), who will forego her acting career after marriage. Because Miss Van De Graff represents a considerable investment to those who finance Broadway musicals, the producer of her latest show, Mr. Feldzieg (Dan Morrison), is attempting to see that the marriage never takes place. He is joined by two gangsters disguised as pastry chefs (Benjamin Dennis and Victor McDermott), who are there to look after the interests of the mob. Also present are the hostess, the aging and absentminded Mrs. Tottendale (Olive Hayden-Moore), her dutiful butler (Dale Dobson), a ditsy chorine named Kitty (Kristin Renee Reeves) who hopes to replace Miss Van De Graff as the new star, Martin’s best man George (Jared Schneider) and the Latin gigolo Aldolpho (Richard Payton). Trix (Bryana Hall) is an aviatrix who makes a last minute entrance to save the day. And, of course, there’s the drowsy chaperone herself (Marlene Inman), who does better at imbibing the celebratory punch than she does keeping the bride and groom separated from each other until the ceremony. But this musical would never be performed were it not for the primary show from which it springs. This show concerns a middle-aged man identified only as Man In Chair. Man In Chair (a poor way of designating a delightfully human character with such a pleasing personality) is reclusive and spends most of his time in his apartment listening to recordings of old Broadway musicals. When the show opens, he’s sitting in the comfort of his living room, flanked by his beloved phonograph. He begins by addressing the audience, casually talking about musicals. His favorite is “The Drowsy Chaperone”, a (fictitious) Broadway musical the words of which he can recite verbatim. It’s the same musical which is the subject of the show-within-a-show and as Man In Chair reaches over and drops the stylus onto the record, the story of “The Drowsy Chaperone” comes magically to life behind him. Marlene Inman as The Drowsy Chaperone and Patrick O’Reilly as Man In Chair. Man In Chair is the heart and soul of “The Drowsy Chaperone” and Patrick O’Reilly is masterful in the part. He plays the theatre buff with charm, whimsy, and self assurance. As narrator, commentator, and occasional participant, Man In Chair transcends the musical he loves, and O’Reilly vibrantly captures all his enthusiasm and personality. The songs are lively and consistent with the parody theme. They include “Cold Feets” (what the groom gets just before his wedding), “Toledo Surprise” (a life-altering experience that happens when you cross the mob), and “As We Stumble Along” (what usually happens after drinking too much liquid refreshment). Director and Dio co-founder Steve DeBruyne has crafted an exciting and entertaining production with an exceptional cast. Besides O’Reilly’s wonderful performance, Richard Payton takes a great part and runs with it, giving an outstanding performance as Aldolpho, a Lothario whose amorous swagger in front of the ladies far exceeds any of his romantic abilities. Book for “The Drowsy Chaperone” is by Bob Martin and Don McKellar, music and lyrics are by Lisa Lambert and Greg Morrison. Set, lighting, and sound design for The Dio production are by Matthew Tomich, costumes are by Norma Polk, and choreography is by Kristin Renee Reeves. The five piece band is led by Brian Rose. The dining part of Dio Dining and Entertainment is provided by Chef Jarod DeBruyne. In addition to his Signature Fried Chicken, the buffet dinner includes Italian Sausage, Fresh Garden Salad, Homemade Breadsticks, Garlic Smashed Potatoes, Peas and Carrots, and beverage and dessert. “The Drowsy Chaperone” runs through October 18th. For tickets and information call (517) 672-6009 or go online to www.diotheatre.com. The Dio is located at 177 E. Main Street in downtown Pinckney.